The weather has just been so strange these last couple of months. Yesterday it was nearly 70 degrees. A month ago, though, this is what we had to deal with. 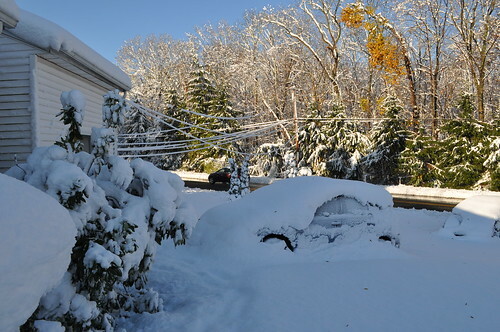 The snow started here just after noon on Saturday, October 29. Our power went out just after dark (and it would stay out, though we didn't know it yet, until the following Sunday night). 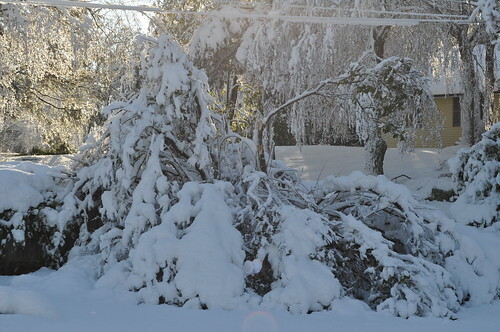 All that night, all we could hear were branches snapping all over the place. Usually weather doesn't phase me too much but I was more than a little nervous during this storm. 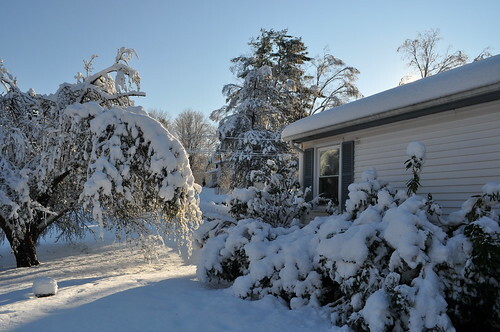 We woke up in the morning to clear blue skies and nearly two feet of heavy, wet snow. Definitely the craziest October weather I ever remember. Because it was October, there were still leaves on the trees, which is what caused so much damage -- the poor trees just couldn't take the weight. My poor lilac was one of the casualties. It needed a good pruning, but it didn't need to be THAT good. On Sunday we ran the fireplace all day (mostly useless for heat, although i did make some awesome baked potatoes in it). We decided to venture out to my library -- there's a generator there because the community center (where the library is located) is the town emergency shelter, and since we had no power, no phone, no internet, and no cell service, we really wanted to get an idea of how bad things were, not to mention check in with our families. That night, it was supposed go to down into the 20s, and we weren't sure how to keep Ian warm enough...so when we got to the library and discovered that they were opening up the shelter, we decided to stay there. But since we're not residents, we didn't want to use cots and other supplies that we weren't entitled to -- plus, why not take advantage of whatever privacy you're able to get? -- so instead we set up camp in my office. I have often joked about sleeping in my office, but I assure you, I never thought I would actually, literally, sleep there. We had Ian in his pack-and-play, and Jim and I slept on an air mattress. Crazy. We slept in my office, cooked and ate in the staff room, washed hair in the sink in the story room...it was an adventure, to be sure. And I worked. A lot. We kept the library open lots of extra hours -- for a time, it was, literally, the only place in town with power -- and holy smokes, was it busy. People coming in to charge things, check their email, use the phone, get coffee (we were brewing it by the gallon), and just warming up....I couldn't believe how many people were in the library, literally crammed into every available space. It was quite the experience -- we'd keep the library open till 9:30, I'd go change into pajamas and read for a while, we'd set up the air mattress and go to bed, then I'd roll out in the morning and empty the bookdrop while still in my pajamas....Surreal doesn't begin to describe it. 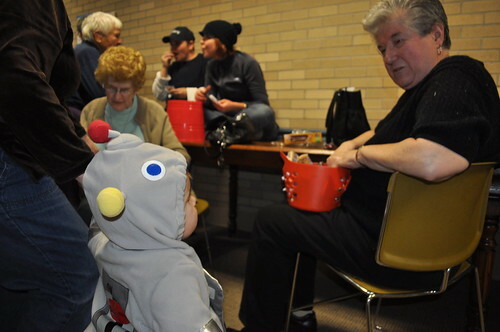 The senior citizens who were handing out candy declared Ian absolutely adorable. 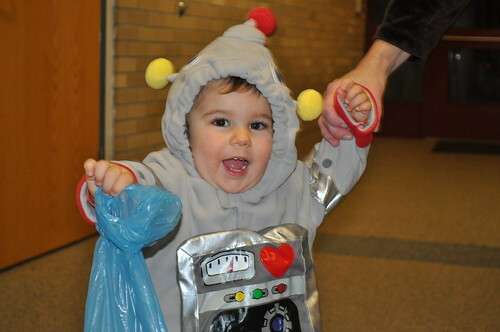 I was handing out candy in the library so I didn't get to walk around with him, but I am told that he was very polite and well-behaved, and even though he's too little to say "trick or treat" he DID say "BEEP!" whenever prompted, just like a good little robot should. Luckily Jim's mom got her power back quite early -- on Halloween night, actually -- so our library camping adventure was relatively short-lived, and we stayed at Camp Grandma until our own power came back. It was a crazy week-plus, let me tell you. But I have to say -- everyone was in the same boat, and the whole experience really brought people together. Our part of CT was the hardest-hit, and even after the power had been out for a week people were still, by and large, cheerful and optimistic and looking out for each other. On the Friday of that week, as the library crowds were dwindling as more and more people got their power back, a man who had been there working daily (needless to say, telecommuting was not working from his house!) said, wistfully, "we should have a reunion in a few months! This has been fun!" And you know, really, it was. It was a giant pain, to be sure, but there's nothing like some good old-fashioned Yankee stiff-upper-lip and can-do and a healthy dose of community spirit to give you the warm fuzzies. But it is REALLY nice to have my power and internet back. Really nice. I'm so glad that you and your family got through it relatively easily, but I must admit my jealousy to the fact that young Ian, in his short life, has already gotten a chance to do a sleep over in a library... The closest I got to that experience was when I was locked into the Rush Rees basement stacks when they closed for the night. (Never mind how I got out. That's on a need to know basis and the internet does not need to know.) 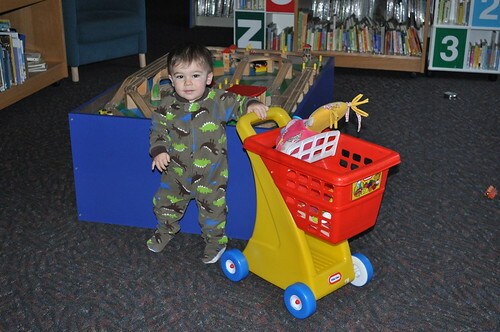 In fact, I'm a little jealous the little guy has a mom with an OFFICE in the library. That's just amazing. I would insist on a sleep over party at the library for my birthday each year. Ian, are you reading this? That would be better than a pony. xoxoxo happy holidays to you and yours! I bet it IS nice! 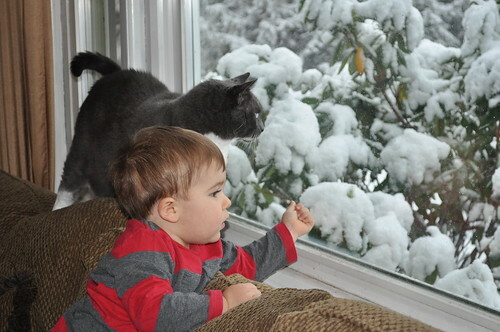 We're supposed to get snow flurries here tomorrow --- wish I had Ian here for color commentary.